Geneva, 17 May 2000 — On the day that the 53rd World Health Assembly (WHA) discusses HIV/AIDS; confronting the epidemic (resolution EB105.R17), public health advocates call for the WHA to provide global pricing information on quality medicines available to treat people living with HIV/AIDS and other opportunistic infections. Member states should also be advised on the management, legal and regulatory issues that must be addressed to ensure access to these medicines. Information on quality generic and patented drug prices enables countries to rationalise their purchasing policy. Developing countries could use this tool to maintain control over their public health policies. It is clear around the world that where generic competition exists, prices of medicines are considerably lower. However, there continue to be regulatory and legal barriers to purchasing and importing medicines. These need to be resolved. “This is the World Health Assembly not the world intellectual property assembly.” said Ellen ‘t Hoen, MSF health policy advisor. “The WHO and countries are here to ensure that the public health of populations takes priority over private profit. Member states need information and choice to ensure the best healthcare for their people.” she added. 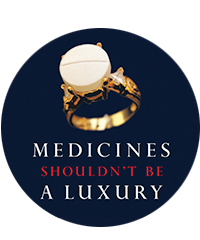 The pricing data would empower developing countries to purchase greater quantities of affordable life-saving medicines to ensure that treatment options are not restricted to limited conditional price reductions which are dependent on corporate generosity. Last week’s statement of intent between UNAIDS and several multi-national pharmaceutical companies camouflages the real issue that long term sustainable solutions are needed on an international level. This agreement does not encourage transfer of technology, nor does it stimulate countries’ rights to produce or import inexpensive quality drugs, an important part of the long-term solution to improving access to medicines. Affected countries in Africa were not included in the preparation discussions of the price reduction and public/private partnership. Affected countries around the world must be included in the process to find long term sustainable solutions.